This campaign ended on November 27, 2018, but you can still make a gift to Colorado School of Mines by clicking here! An Anonymous Donor gave $250 because 20 donors made a gift in 34 days. We are crowdfunding specifically for an exoskeleton competition. However, any funding we raise will benefit the club as a whole. The STARX Design Competition stands for STrength Augmenting Robotic Exoskeletons. Held by the University of Michigan, Mines will be competing for the second time this year in late April. The competition challenges students to make a practical powered exoskeleton that increases the effective strength of the user. 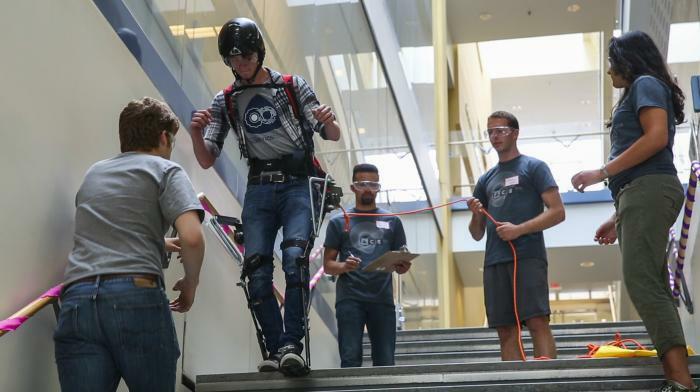 By basing designs on current research, the competition aims to bring exoskeletons to a functional level that can be applied to real world use. For example, last year, the exoskeleton suit Mines built had to traverse an obstacle course that a firefighter would train on. After our five-person team won last year's competition, we plan to return to Michigan and defend our title. We plan to help this team cover their $2,000 dollar travel and build budget for the exoskeleton. By helping this team, Mines Robotics further promotes our mission of bringing competitions to students and promoting the Colorado School of Mines; name in robotics.